Last year, I read Ray Bradbury's writing essays from his Zen in the Art of Writing and felt like he’d given me marching orders for Bradbury's Book Camp for Writers. Zen is a short but powerful book and lights a fire under you with his passion and zest for life and writing. I've been in sort of a writing slump lately and decided to revisit his book. There are so many snippets I underlined and wrote down, it is hard to know where to start. What if the Subconscious to every man, in its creative aspect, became, for writers, the Muse. How do you feed your muse? Read poetry every day which will flex your muscles and expand your senses. Consume essays, travel through the centuries. Learn and fill up your senses with the shape and size of the world, every color, smell, texture and sound. Read Short Stories and novels. Not only those who write the way you think but those that don't. It all serves to stimulate your Muse's tastebuds. And while you are feeding your muse, you have to keep it shape. And you do that by writing 1000 words a day for the next ten to twenty five years. Why? ...to learn enough about grammar and story construction so that these become part of the subconscious without restraining or distorting the muse. In the essay Zen in the Art of Writing, he goes on to say follow your own path, write for the right reasons and not for the money or accolades. Fame and money are gifts given us only after we have gifted the world with our best. So work at your writing and shoot for 1000 to 2000 words a day for the next twenty years. Write one short story a week for 52 weeks for five years. Much like the surgeon or artist or athlete train for years before they become proficient and successful, so must you train. Quantity provides the experience and with experience eventually comes quality. As in all things, writing takes practice. So feed your muse and start practicing. To feed well is to grow. To work well and constantly is to keep what you have learned and know in prime condition. Experience. Labor. These are the two sides of the coin which when spun is neither experience nor labor, but the moment of revelation. The coin, by optical illusion, becomes a round, bright, whirling globe of life. His idea to read one short story, poem and an essay a night applies for readers as well. You know me and my rabbit trails. Just think of all the directions our reading could take. 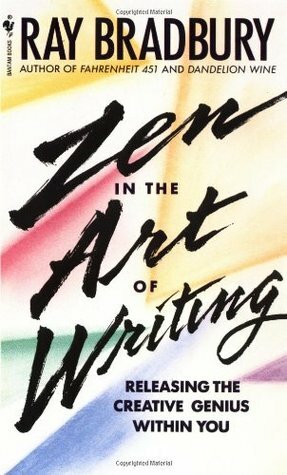 So, whether you need reading or writing motivation, read Zen in the Art of Writing. Also, when you have the time, check out this video – An Evening with Ray Bradbury 2001 of his keynote address at The Sixth Annual Writer's Symposium by the Sea. If you have any favorite poetry or essay books, I'd love to hear about them. I've missed the linkys again. My links to my reviews are included. Thanks lots. Have a great day! Hey Julie and Sherrie, Add your links to the current week no matter where you are week wise. Yes, it's just an incredible writer, I read almost all of his works. His style of writing books is very difficult to repeat, I just had in my childhood dream of becoming a writer , so I even appealed for help to these guys paidpaper.net and you know, it really works. My writing skills are becoming better and better. I was inspired by Bradbury. Especially his book Dandelion Wine is my favorite. I think it's an amazing skill of the writer. Also, I ordered a presentation https://academic-consultants.com/ in honor the work of this author. And I made a speech at a conference in my college.